That is like the coolest job ever! It sounds like you guys have so much fun. 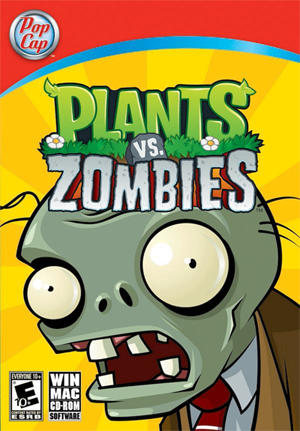 I think you did a great job with the Plants vs Zombies box design because my friend actually bought it after seeing a big zombie head on the shelf at Target. Go Paula! That’s so cool ^_^ If she doesn’t see your comment I’ll be sure to let her know that! I also remember noticing the big zombie head when we were walking around Target and Walmart… I think they did a spectacular job with that. Hey, glad to hear that the big zombie head worked! PvZ was so fun to work on. 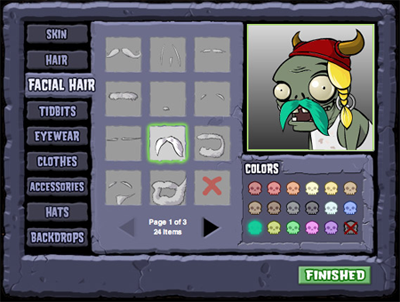 Working on anything for PvZ always makes us laugh because we try to think like Zombies. Everyone should try to do that! Man . . . I really enjoy reading this blog. I actually have a soft spot for these kinds of companies, usually gaming ones, I really want to know, does it make work really enjoyable? It seems quite interesting how you describe your work at Popcap! Anyway, kudos to you Paula, hope you continue enjoying your job at Popcap! Btw, has anyone actually drank the Brain Ooze? I haven’t What does it taste like? It’s drinkable, and I’ve hoarded about 4 cans, don’t tell anyone though. I do that when I think the packaging is cool. If all else fails, I have a stash of Brain Ooze. Hey shigi, I really love your music – you are really talented. My favourite ever vgm was by Koji Kondo – dire dire docks from super mario 64. Whats yours? And I read in one of your interviews that you played starcraft! what was your favourite civ? its the music when you are on a final level of a stage! It freaking rocks!!!!! Can you do a perform it on the piano please?? I am sure everyone will love it! its easily the best track on there!! The pool level music and dr.zomboss were also wicked tracks. ps I also play the piano, and yes i can play some vgm – i can play songs from mario 64 and zelda. Hi Milan, thanks for your comment… hmm, that’s a tough question! I don’t think I can pick just one… but some of my favorite VGM tracks: From Chrono Cross – Time’s Scar, Dream Bordering the Shore of Another World, Star-Stealing Girl, Time of the Dreamwatch… From Megaman 5: Wave Man, Protoman’s stage, Gyro Man… From Megaman 3: Hard Man, Magnet Man… From Little Nemo: the final boss battle, From Chip N Dale’s RR: the final stage… From FF-games: Coin Song, Road to Zanarkand, Kaze no Ne (Crystal Chronicles), Suteki da Ne (FFX)… From Chrono Trigger: Belthasar’s theme, Schala’s theme, Kingdom of Zeal… From Secret of Mana: the 3rd Flammie theme, Dyluck’s theme, the Mana boss and battle theme… I like the Darkwing Duck music too, but I can’t remember the particular stages that they’re from. Oh, and Tor’s theme from Iji. Haha, there are more too, but I probably shouldn’t try to name them all, haha 😛 Ahh… I have been trying to make a piano version of Ultimate Battle since it’s probably the most requested piece. I can play the melody with chords, but it’s challenging to try and make it sound good on the piano since it’s really a piece that has many things going on in the arrangement. But I’ll keep trying! I am a big fan of PopCap and the Paula Wong! Plants vs Zombies are such a popular game among my son’s friends. We definitely can use more merchandise. Fans a re waiting out there!!! The Paula Wong is, indeed, the coolest. I’ve had the privilege of working with her at PopCap for the last 3+ years, and I can say that I’ve never met a more creative, positive, and happy person in our industry. She is a glowing sunflower; bringing us sunshine to fight the zombies of our work-a-day lives. Paula is one of the most amazing people I have the privilege to know. The fact that she is a force in her industry is an inspiration to not only women, but all of her peers. Hi Paula. Your job sounds awesome. I was wondering if I could ask a follow up question. I have some friends who want to get into marketing but the more creative side similar to what you seem to be in charge of. What kind of education or jobs did you pursue that you think helped you find your way to this kind of career? I went to art school (Cornish College of the Arts in Seattle) and worked as a graphic designer, art director and creative director before coming to PopCap. One could also pursue marketing or creative writing as well. Hope that helps. Another girl in the video game industry here! Lead Sound/Composer at Cadillac Jack (video slot machines). Love all the sounds in PvZ and was thrilled to see they were done by a girl! I bragged to all the guys in the design group! Thanks so much for doing this interview, Laura! It’s always interesting for gamers (and non-gamers) to get to know the staff behind the games more. Reading this makes me want to work for PopCap, haha. I would agree that if a line of merchandise do get released, I’d definitely save up for them! Look out for the collectible Zombie figurine in the new Plants vs. Zombies Game of the Year Limited Edition. It will be hitting retailer shelves in mid-August. Ahhh! That is so cool!! 🙂 George hasn’t mentioned this to me yet, so I’m not sure if he even knows about it. I’m sure he’s going to be really excited about it though! That’s indeed awesome!! 😀 I can’t wait to see that on shelves!